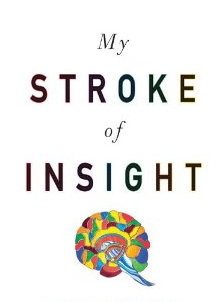 One of my close friends recently suffered a stroke, and I was drawn to re-read My Stroke of Insight: A Brain Scientist’s Personal Journey by Jill Bolte Taylor, Ph.D.
What makes this book special is the spiritual insight it offers. When the author’s left hemisphere of her brain was incapacitated by a hemorrhagic stroke, she experienced the spiritual feeling of “oneness” with the universe, feeling no distinction from her body and the rest of the energy molecules around her. In the absence of the judgment of her left mind, she experienced deep internal peace and joy, the “Nirvana” that exists in the consciousness of our right brain. She explained how, at any moment, we can choose to hook into that part of our brain. Meditation is one way, and definitely, a less traumatic way than suffering a stroke. She also offers wonderful insights into quieting the constant “story telling” and chatter of the left brain, to bring you into the now, the peace of the right brain which only experiences the present moment, where there is no fear or anger. I was impressed with her scientific explanations of how we experience these negative emotions physiologically for 90 seconds, but can then choose to let them go and return to a peaceful state. Thanks Becca. I will check this book out after I am through reading The Chakra Diaries.